By and large, many struggling players benefit from trades. It seems like that’s the case for Niagara IceDogs forward Kirill Maksimov (Maximov), who benefitted immensely from a mid-season trade from Saginaw. Regrettably, Maksimov didn’t have a good start to the season, with 16 points in 37 games with the Spirit (6-10). As a result, NHL Central Scouting midseason rankings put him at 185th. His game really picked up as a result of being traded to Niagara. He racked up 22 points (15-7) in 29 games with the IceDogs, including hat tricks in consecutive games. In the playoffs, Maksimov averaged a goal-per-game, with four tallies in as many games. Consequently, this offensive boost rocketed him up to 66th in Central Scouting’s final rankings. Through two OHL seasons, the 18-year-old has 66 points in 128 games. Kirill Maksimov started scoring with more consistency after his trade from Saginaw. Maksimov’s offensive boost was arguably aided by his playing time spent alongside Johnny Corneil and Ryan Mantha. He also saw playing time alongside Akil Thomas. Corneil and Mantha were four and three-year OHL veterans, while Thomas was a rookie. Because of their combination of skills and experience, all four players benefited. Corneil led the IceDogs with 62 points, while the defenseman Mantha had 58 points. Thomas, 17, scored 48 points (21-27) in 61 games. Maksimov has twice represented his native Russia in the U18 World Championships. In 2016, he was held scoreless as part of the U-17 roster that replaced the original squad amid the doping scandal. Of note, he scored three goals in seven games as Russia won bronze in 2017. Furthermore, before joining the OHL, Maksimov played bantam and minor midget AAA hockey in Toronto. In conclusion, Maksimov is an underrated prospect with strong playmaking skills. First of all, his speed makes him a factor even when he doesn’t score. His talent on the forecheck is also an attribute to watch. It seems like he’s learning to work with his size, and he can bulk up to become a stronger force on the ice. In addition, he’s still young. Maksimov just turned 18 on June 1 and has plenty of room and time to grow. It seems like Maksimov could be a late second-rounder but is likely to get picked in the third or fourth rounds. “It’s been a wild ride for the Moscow native who left Russia to play his minor hockey in the Greater Toronto Area. 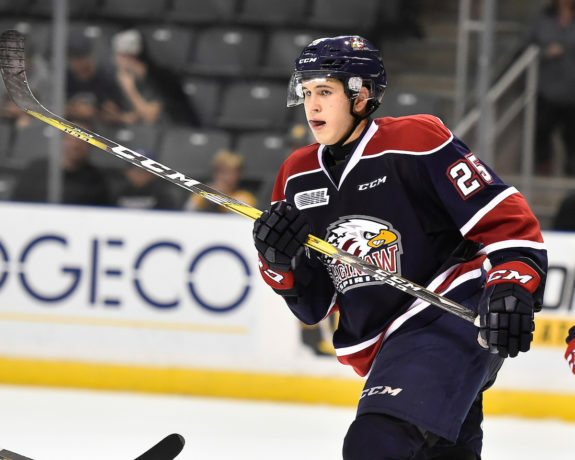 As a result, he was taken by Saginaw in the second round of the 2015 OHL Priority Selection before being moved to Niagara. Add to that the stress of playing as an underager in the 2016 U-18s due to the Russian doping scandal and Maksimov has faced more adversity than most in this draft class. He finished the regular season with 10 points in his last seven games before scoring in each of Niagara’s four playoff games against Peterborough. He added three more at the U-18s, helping Russia to a bronze medal.” – Sam Cosentino, Sportsnet. In conclusion, Maksimov projects as a third- or fourth-line winger with his size and speed. He’s got a strong offensive game but also needs to work on his defensive side. Maksimov played for Russia in the 2016 U18 World Championships and subsequently won bronze with his home country in 2017. He was also a Scotiabank Playoff Champion in the GTMMHL in 2013.